So Nice for Coffee soy creamer in its standard 500 mL packaging. As much as I like soy milk, I’ve never been able to bring myself to add it to my morning coffee. My lactose intolerance isn’t so bad that I can’t have a splash of milk in my cup of Ethiopia Sidamo at Starbucks. 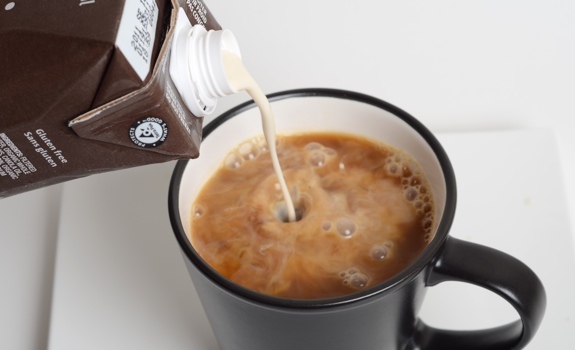 At home, there’s usually always a jug of Lactaid-treated organic milk in my fridge that I keep on hand for coffee, cereal and baking purposes. As a coffee snob, I’ve always disliked artificial creamers. Creamers always dredge up terrible memories of church basement coffee tables, of syrupy hair-salon/muffler-shop java in Styrofoam cups, of the communal coffee pot we used to have at the office (25 cents per mug? Awesome!). So there’s admittedly some apprehension on my part whenever I’m confronted with a creamer that isn’t milk. 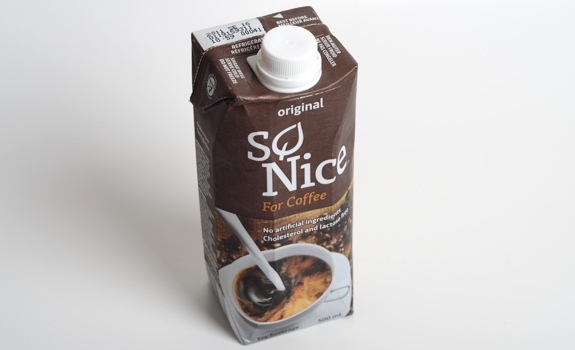 I first saw So Nice for Coffee in the cooler at my local Planet Organic many months back, and I’ve been temped to try it and post the results here. So, when a rep from So Nice dropped me a line and offered to send me a sample, I could hardly refuse. The Packaging: It’s a Tetra Pak with a little screw-top cap for easy opening and closing. The package is designed to allow it to be used in little pours here and there, as it’s meant to be opened and closed repeatedly whenever you’ve got a cup of coffee that needs fixing. But look out for the glub-glub-glub pour from the spigot, or you’ll end up with coffee/creamer on your tablecloth. The Look: Pours thick like cream, and stirs easily into the coffee. Compared to 2% milk, you’ll need less to have a similar clouding effect. It’s more like coffee cream than skim milk. The Taste: Doesn’t try to hide the soy. If you hate soy milk, you’re not going to like this. But if you’re cool with soy milk, it’s not bad. It tastes more like soy cream, if that makes sense. The texture is thicker than milk, and it adds that to the coffee. The Difference: I guess what I’m saying is that I’m used to the taste of milk in my coffee, so the curious taste of So Nice creamer draws my attention away from the coffee, and masks other flavours. This doesn’t matter as much to me with cheaper, lower-grade coffees (ie. two-kilo tins of Nabob at the office), but in my cup of yummy Brazilian “IP” from Transcend, it drowns out some of the coffee’s flavour notes. Will it replace milk in my fridge? No. But I can see the allure for vegans and those with severe lactose/dairy issues. Despite the glub-glub-glubbing from the spigot, no So Nice for Coffee landed on my trusty Nikon. Hurrah! Cost: $2.69 for a 500 mL bottle at Planet Organic in Old Strathcona. But I got my sample for free from So Nice. Value for cash money: Good. A little dab’ll do ya. Availability: Limited so far. It doesn’t have to be refrigerated until opened, so maybe check the shelves in your grocery store’s health products aisle as well as in the soy milk section of the cooler. Stock up on them when you see them, and keep them in the pantry until you need it. Nutrition? : Per 1 tablespoon (15 mL): 20 calories, 1 gram of fat, 0.4 grams of protein. The verdict: Nice to try it, though I don’t think it’ll become a fixture in my fridge. But if you’re a recent vegan convert who longs to be able to drink your coffee with a splash of cream, then you’ll be delighted. If you’re highly lactose intolerant, same deal. It’s better than other non-dairy creamers I’ve tried. I’ve been eying this up since Christmas time now and haven’t yet brought myself to try it. I’m curious as to whether you’ve tried the Silk Soy Creamer, and if so how it compares with this one? I haven’t tried the Silk creamer, though I’d be curious to know how this one compares. I am not a fan of fake cream products, and I feel that the silk creamer original even has a sweetness to it, and I don’t like sugar in my coffee. Although I am not vegan, I strive to avoid dairy. I really like this so nice creamer, and friends who do like dairy cream have been surprised as to how good it is when at my house. My frustration is that now I can’t find it. Planet Organic, safeway, save-on, superstore, all carried it and now they don’t. Or they just run out very quick. I am not sure if there is a distribution issue. I want it back though! Funny enough, I reacted terribly to this. It taste great as a substitute for someone who is lactose intolerant. However, instantaneously after having it in my coffee my IBS flared up like mad. Has anyone else reacted badly to it???!! If so, any idea why?? Me too! It took me 2 weeks to realize this was why my asthma went CRAZY. Unreal. Aside from that, I prefer no sweetener in my coffee, it was kind of soy-ee tasting, which took away from coffee’s lovely taste. It did make a nice colour, but breathing is IMPORTANT. Thanks for writing about your reaction. Nice that I’m not alone. I wonder was it the ‘organic soy’ or something else. Perhaps too much soy for one lady. I love tea and coffee, none of the flavoured stuff for me. Having dairy and gluten intolerances really put a damper on my enjoyment. I tried Silk but it’s very thick and heavy tasting. So Nice is far better, so say my taste buds, and now that I’ve used it for 2+ years, I am unaware of the fact that it’s not cream or milk from a cow. I buy So Nice for coffee at Superstore or Save on Foods. Because it’s in a tetra pack, it can last months in the pantry, so I buy a case when possible. It’s also good on cooked cereal, to make rice pudding, and I use it when recipes call for milk. I suppose it’s a matter of taste.